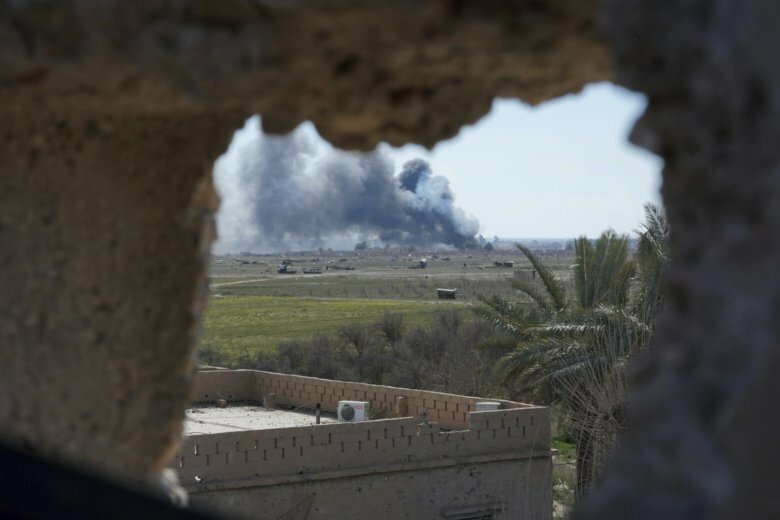 BAGHOUZ, Syria (AP) — Hundreds of people, including Islamic State fighters, evacuated the extremist group’s last foothold in eastern Syria on Monday, after U.S.-backed Syrian fighters again slowed their offensive to allow a way out of the tiny enclave. The new exodus came only three days after the Kurdish-led Syrian Democratic Forces resumed military operations against the militants holed up in Baghouz, a village on the banks of the Euphrates River close to the Iraqi border. In past weeks, thousands of civilians left the speck of territory in organized evacuations following an earlier halt in fighting. The SDF said its fighters were surprised by the number of civilians, who include IS family members, cooped up in the small area that has been squeezed smaller and smaller by intermittent military offensives. An SDF media official who goes by his nom de guerre Ciyager said over 1,000 people, including a number of fighters, evacuated the area controlled by IS on Monday through a safe passage that has allowed those wishing to exit a way out. Dozens of men, women and children climbed hills on foot and were later seen getting into small trucks after they were searched by SDF fighters manning the evacuation corridor. Shortly before sunset, more than 20 trucks, usually used to transport animals, emerged from the IS-held area, carrying men, women and children. One woman covered in black flashed a victory sign as she left. The evacuees included a man who said he was French, men and women from Indonesia, Turkey, Turkistan and Bosnia and many Syrians and Iraqis. Some of the men were of fighting age and appeared healthy while others were wounded. Some carried crutches, and a man with face burns and a broken leg was carried off the truck on a mattress, intravenous needles visible in his arm and hand. A skinny man, with short dreadlocks, stepped off the truck in a daze. Since Feb. 20, an estimated 15,000 people have left the IS-held pocket, producing dramatic scenes of women shrouded in black and many children climbing off trucks into a desert area to be screened and searched. They were then whisked to a camp for displaced people to the north, while suspected fighters were moved to detention facilities. Military operations restarted Friday, with a ground advance a day later that followed a spectacular air assault that lit the skies of the tiny village. IS militants desperately fought back with snipers, car bombs and other weapons trying to slow the SDF advance. Lewla Abdullah, an SDF official, said at least three car bombs had been deployed in the campaign, and at least four SDF fighters and more than 100 IS fighters were killed since Friday. She said IS was holding civilians and others hostage. Despite the slowing of the offensive, officials said the campaign was expected to finish soon. With the militants besieged on three sides by the SDF and civilians continuing to leave the pocket, a military defeat of the IS fighters seemed inevitable, though it wasn’t clear how many fighters remained in Baghouz. An SDF official, who goes by the name Mervan The Brave, said many IS gunmen were still inside and prepared to fight. “This is not the end. We are maybe on the threshold of a new battle,” he said. Retaking the sliver of land would be a milestone in the devastating four-year campaign to end the Islamic State’s self-proclaimed “caliphate” that once straddled a vast territory across both Syria and Iraq. The extremist group continues to be a threat, however, with sleeper cells in scattered desert pockets along the porous border between the two countries.